To connect your arrow indicator with its custom inputs without integrating the MT2IQ library code you will need a special connector. This connector will be customized by our support team for your arrow indicator and the indicator input parameters will be integrated directly into the connector, so you can change them inside the connector. In this case, the connector will catch the arrow signals from your connected arrow indicator with the set of input parameters you defined in the connector. In the following example we will describe this service based on the arrow indicator called ReversSignals.ex4. ReversSignals indicator has 7 input parameters: RSI_HIGH, RSI_LOW, RSI_PERIOD, STOCH_HIGH, STOCH_LOW, CCI_HIGH, CCI_LOW. If you connect this indicator with the default indicator connector, you can get the arrows only with the default parameters of these inputs. But if you want to change the inputs to increase the accuracy, we will have to integrate the indicator inputs into the connector. After adjusting of the arrow connector to your special indicator inputs we will add the Custom Inputs Section to the connector. 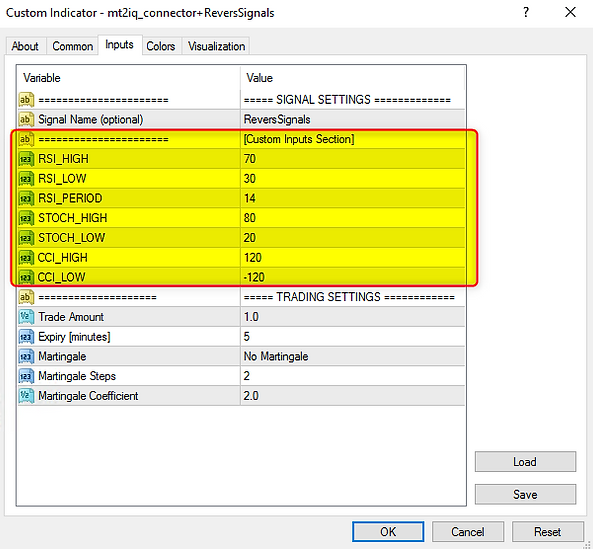 So you can change the input parameters of your connected indicator and the connector will catch these signals and send them to the bot for placing trades on your iq option account. Here you can let our coding team to create your own custom connector for your indicator that has input parameters. We will integrate the inputs in the connector, so you can change the inputs directly in the connector. Submit your indicator in the form below.